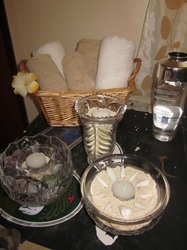 My friend Christy makes the most wonderful homemade spa treatments. We decided to combine what we both know best and put together a Girls Night! 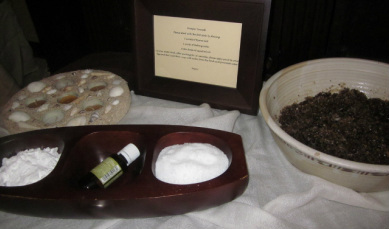 Christy made the coffee scrub and displayed the ingredients for the foot soak with framed instructions. 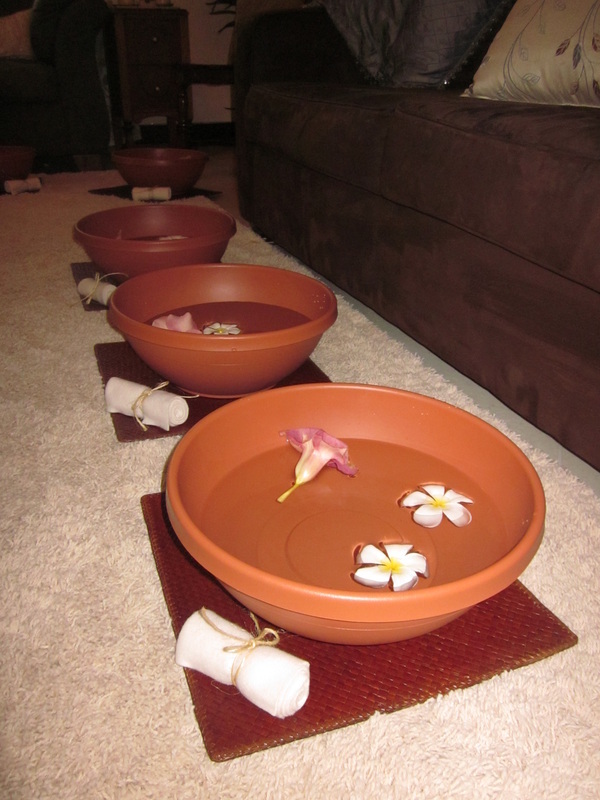 The event was very casual and each of our guests were able to apply their own treatments throughout the evening. I would characterize the decor as "island spa." Luckily most of the elements were found right outside our front doors. For the spa treatments we purchased bowls from our local hardware store, placed them on bamboo place mats, added a rolled towel tied with raffia and floated plumeria flowers. Scattered around the room we used white candles, crystal and glass holders, sand and shells. 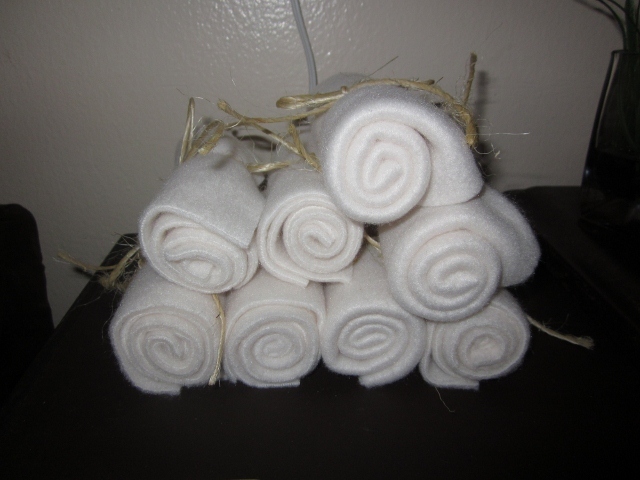 I love to decorate a party with usable items like the basket of towels and lotion. When hosting an event, I always want my guests to have an incredible first impression as well as a lasting impression. Also used as part of the decor, I printed the recipes for the foot soak and scrub mounted them on an island themed card stock and wrapped them both in raffia. I placed the favors in sand so that each of our guests would be able take one as they left. For the food and beverage, our menu included: tortilla roll-ups, cucumber sandwiches, hummus with warm pitas, a skewer of mozzarella, basil and tomato, chocolate mousse spoons and NY Style cheesecake. 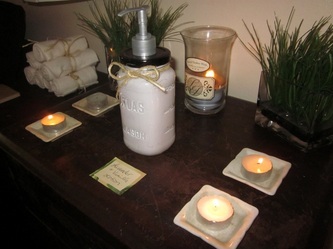 We displayed the food on one large antique buffet table - it was a perfect touch to our soothing spa color scheme. 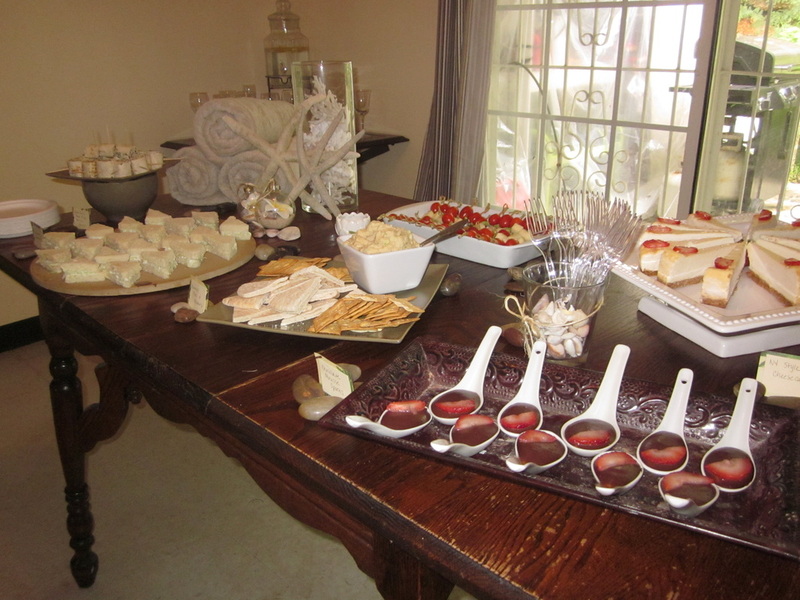 We used shades of brown and white for the serving pieces to keep the presentation of food clean and simple. 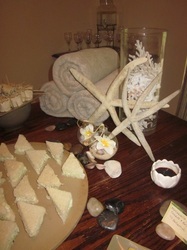 We decorated the table with rolled towels, glass, coral and shells. I used the same cardstock as the favors and created buffet labels surrounded by river rocks. Cucumber and Lemon Water was also served in wine glasses.